Kim Jong-un, North Korea leader’s maternal ancestry line is Jeju island, South Korea. Why was the grave of Kim Jong-un’s mother hidden under a shroud of secrecy in North Korea? There is a claim that North Korea is not willing to glorify the grave site of Kim Jong-un’s mother, Ko Young-hui, that is located on the Mt. Taesong area, near to Pyongyang in North Korea. This is allegedly due to the Ko family’s Jeju, South Korea-Japan heritage. Ko Kyung-taek, Ko Young-hui’s father was born in Jeju and migrated to Japan in search of work. He gave birth to three children including Ko Young-hui, and moved to North Korea in early 1960s. 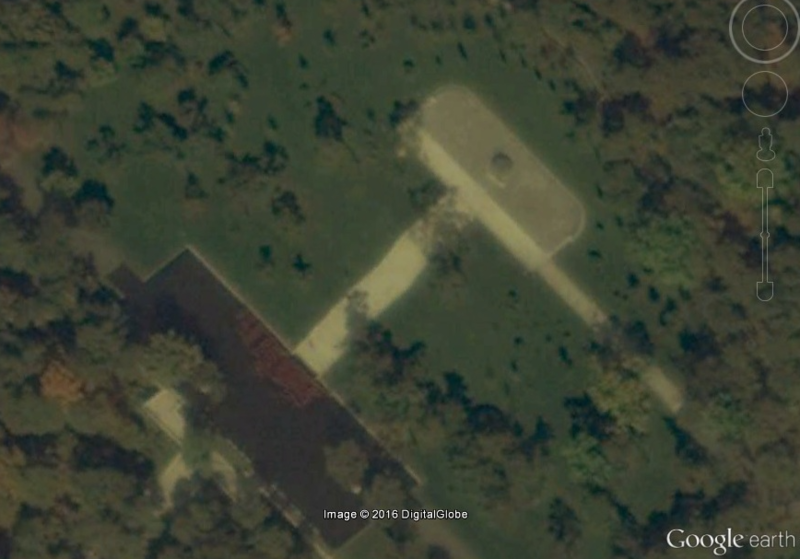 Curtis Melvin, a researcher at the US-Korea Institute at Johns Hopkins University and a contributor to 38 North said that Kim Jong-un has “quietly” built a grave for his mother, Ko Yong-hui, on Mt. Taesong, Pyongyang but it has never attracted North Korea’s media attention. It is presumed that the construction of the grave site was completed by October 2012. Free Radio Asia (FRA) quoted Melvin that Kim Jong-un’s grandfather was labelled as a ‘Japanophile’ as he moved to Osaka, Japan from Jeju island and worked in an Osaka sewing factory run by Japan's ministry of war. The reason why North Korea built his mother’s grave, but does not try to publicize it, is since it does not complete the idolization of Ko Young-hui because of her Jeju (South Korea)-Japan ancestry heritage. What happened to Ko Young-hui’s father and his grave on Jeju island? The Chosun Ilbo reported on Jan. 28. 2014 that Ko Kyeong-taek was born on Jeju in 1913 and passed away in North Korea in 1999. His daughter, Ko Young-hui, was the leader’s mother, producing a child with Kim Jong-il. Ko Kyeong-taek boarded a ship to Japan calling at one of Jeju’s ports. It was 1929 and he was about eight-years-old. The first half of the 20th century was a time of relative exodus and extreme poverty for Jeju. Throughout Japanese colonization, many Jeju locals fled to Japan for survival. Ko arrived in the industrial city of Osaka, Japan, the city where most people from Jeju worked in Japanese factories. The estimated 22.2 percent of Japanese-Koreans in Osaka are known to have Jeju heritage. Most Jeju settlers worked in the glass or rubber factories, yet National Intelligence Service records show that Ko worked as a tailor. Kosuke Takahashi of the Asia Times claims he even "made Imperial Japanese Army soldiers’ uniforms in a sewing factory during World War II." The Chosun Ilbo, however, claimed that Ko worked in a munitions factory and was a human trafficker, for which he was deported from Japan. 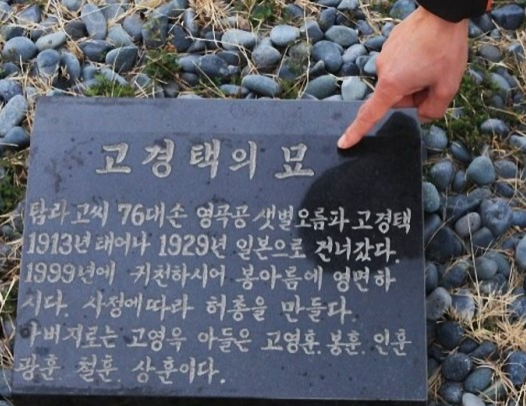 Conclusive evidence surfaced on Jan. 28, 2014 that showed Ko Kyeong-taek’s memorial plaque was located in Jeju City. The plaque was at his family’s gravesite along with other 13 tombs. However, his body was not interned at the site, having been buried in the North. The plaque is called ‘Gachong (가총)’ or an ‘empty or fake grave.’ The reason for building the plaque is so that ancestors are able to perform the ancestor rites. In particular, after the Korean War, many empty graves or plaques were erected in Korea because many family members were missing. After the discovery on Jan 28, the Ko’s memorial plaque then swiftly disappeared. 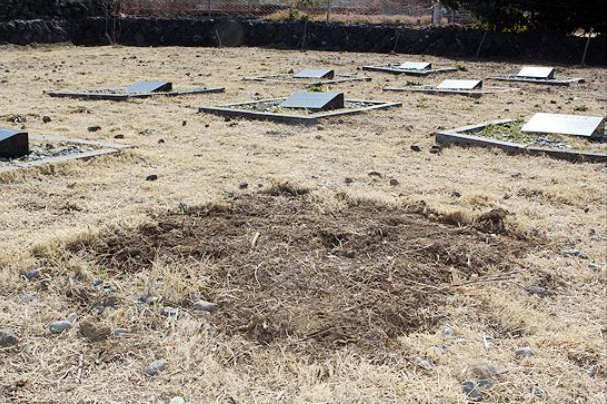 Jeju police announced that relatives of the deceased had relocated it for safekeeping. His family is known to be extremely sensitive to the discovery and not willing to reveal their names. It is believed that one of his relatives keeps the plaque at his own home. Kim Jong-un’s mother to be idolized as Baekdu (North Korea) - Halla (South Korea) mixed bloodline? Ko Young-hui, Ko Kyeong-taek’s daughter, and mother of current North Korea’s leader moved to North Korea from Japan in May 1961 or in 1962 as part of a repatriation program. In the early 1970s, she began working as a dancer for the Mansudae, Art Troupe in Pyongyang. It is known that Ko and Kim Jong-il first met in 1972. Ko gave birth to three children including Kim Jong-un. Many sources report that she died of breast cancer in France in 2004. Her siblings - the offspring of Jeju-born Ko Kyeong-taek - rose to prominence throughout the North’s regime. Her older brother Dong-hun was a diplomat and her younger sister, Yong-suk, managed Kim Jong-il’s secret funds in Geneva, before defecting to the US. Ko's Jeju, South Korean-Japanese heritage would make her part of the ‘hostile’ class. As she emerged as the most influential woman in a regime beset by dynastic rivalries, her suspicious birth connection to Japan and Jeju heritage remained shrouded. Furthermore, the regime is constructing a myth around the Jeju people, glorifying it as an anti-American Communist rebellion in support of Pyongyang, Kiyohito of the Asahi Shimbun reports. Meanwhile, fear also exists among some; to glorify Kim Jong-un’s maternal line - “Halla (South Korea’s highest mountain in Jeju) and Baekdu (North Korea’s highest mountain) become one”- the North Korea will emphasize Jeju as a rebellious island and the Massacre will be viewed as a collapsed revolution. [Video] "North Korea is So Predictable!!"